Every summer, I chop & freeze vast amounts of rhubarb in preparation for my annual batch of Pineapple Rhubarb Jam. (We have 5 huge rhubarb plants in our back yard.) I blogged about the rhubarb back in August, thinking I would get to the jam pretty soon thereafter. I was wrong. We've had such a beautiful, warm fall here in Saskatchewan (and I, for one, am not complaining) that I kept putting off the jam making for a cooler day. The cooler days just didn't come until October! Last week, I finally got it made. It's done for another year. I present to you the jam recipe that has been adapted from my husband's grandma's recipe. I started out with 56(!) cups of rhubarb. Fifty. Six. Thankfully, after rhubarb has been frozen & then thawed, it reduces it's volume by about half. Okay, now I was working with only 28 cups. So, I multiplied this recipe x5. Mix rhubarb & sugar, bring to a boil, stirring until sugar dissolves. Boil for about 10 minutes. Stir often so it doesn't burn. While it's boiling, start preparing your jars. With lids removed, soak the jars, lids, & seals in hot tap water in the sink. Leave them in the hot water until you're ready to use them. Add Pineapple & boil for another 10 minutes. Stir often so it doesn't burn. Remove from heat. Add jello powder & mix well until dissolved. Pour jam into jars & seal. Tips: I fill my jars almost to the top, then wipe around the lip of the jar to get any spilled drops. Apply the lid. Cool on the counter until the jars have "popped". You will hear the seals popping as they seal. Test the tops by pushing down on them, if they don't move, they are sealed. If they pop down & then up again, you will have to store your jam in the fridge or reseal. To help with the sealing process, always use new seals. Thanks to those of you who joined me on the jam journey on Facebook last week. It made it fun for me to interact with you while I was cooking & preserving. Thanks for your questions, Jenn! 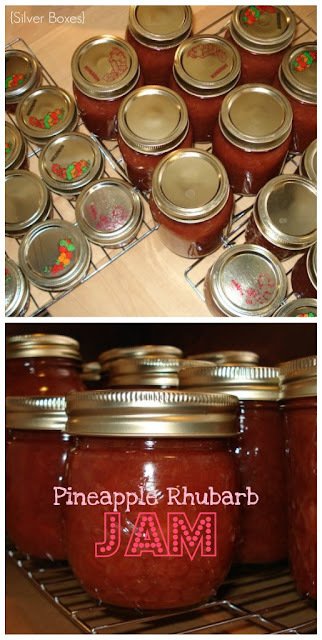 I use canned pineapple & I make & can a huge batch every fall & we use it throughout the year. I've never had any issues with spoiling. I hope that helps! what size box of jello do you use?